A PCM-H16 system shown with optional hardware controller and monitor. The PCM-H16 is a SADiE studio workstation based on the latest generation of DSP processing technology for use with the SADiE software environment. The PCM-H16 can replay and edit 64 channels of 24bit 48kHz audio with real-time cross-fades and punch-ins, and offers similar DSP processing power to the PCM-H64 multi-track system. The PCM-H16 can be supplied with a choice of SADiE software packages tailored to specific applications. 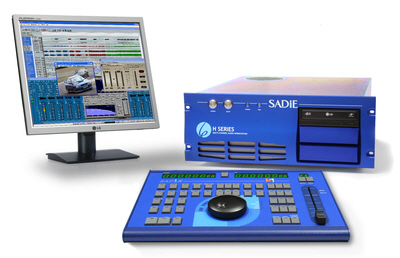 For further information about the software features, please see the SADiE software page. In TV post-production studios, the powerful stem controls enable different versions to be track-layed and mixed within one EDL. It can also be supplied with integrated non-linear video record and replay, which uniquely amongst workstations, allows the video stream to be cut and edited in the same EDL alongside the audio. Further suitable installations include surround mastering studios for music and DVD/HD soundtrack preparation, where the ability to edit and layer multiple 5.1 stems offers unmatched flexibility and creativity without the need to bounce or render any audio. Zero-latency support for DirectX and optionally VST plug-ins is provided. Full support for console control is available, supporting desks such as the SSL AWS900, Yamaha, and Mackie HUI variants. At the heart of the PCM-H16 is a PCM series PCI DSP card with two 8 channel daughter cards. These each have a 44 pin D-sub connector to for connection to optional 19" rackmount Break-out Boxes (BoB800). As a turnkey system, this is supplied in a 4u rack PC with keyboard and mouse (no monitor). Specifications of the host PC change periodically and there are various PC related options for HDD size, CD burner, graphics cards etc. Please contact us for details. This is currently supplied with Windows® 7 software. CAT card "Control and Timecode" interface - provides synchronisation and 9-pin RS422 control features.